How long will it take to burn off that soda? Alerting teens about how much walking or running they would have to do in order to burn off the calories in a soda or other sugary drink might convince them to choose a lower-calorie beverage, researchers say. "People don't really understand what it means to say a typical soda has 250 calories," study leader Sara Bleich, an associate professor in the department of health policy and management at Johns Hopkins University Bloomberg School of Public Health, said in a university news release. "If you're going to give people calorie information, there's probably a better way to do it. What our research found is that when you explain calories in an easily understandable way such as how many miles of walking needed to burn them off, you can encourage behavior change." For the study, Bleich and her colleagues installed brightly colored 8.5-by-11-inch signs in six corner stores in low-income, predominately black neighborhoods in Baltimore. The signs informed consumers that a 20-ounce bottle of regular soda, sports drink or fruit juice contained 250 calories and 16 tablespoons of sugar, which would require 50 minutes of running or 5 miles of walking to burn off. The researchers observed nearly 3,100 drink purchases at the stores by teens between the ages of 12 to 19 years. They interviewed 25 percent of the youngsters. Of the 35 percent of teens who said they saw the signs, 59 percent said they believed the information on the signs and 40 percent said they changed their purchases as a result. Sugary drinks accounted for 98 percent of beverage purchases in the stores before the signs were posted, compared with 89 percent after the signs were put up, the researchers found. Many teens also chose to buy smaller sizes. And the number of sugary-drink calories bought by each teen went from 203 calories to 179 calories, according to the study. The percentage of teens who decided not to buy a drink rose from 27 percent to 33 percent, and water purchases rose from 1 percent to 4 percent, according to the study published online Oct. 16 in the American Journal of Public Health. 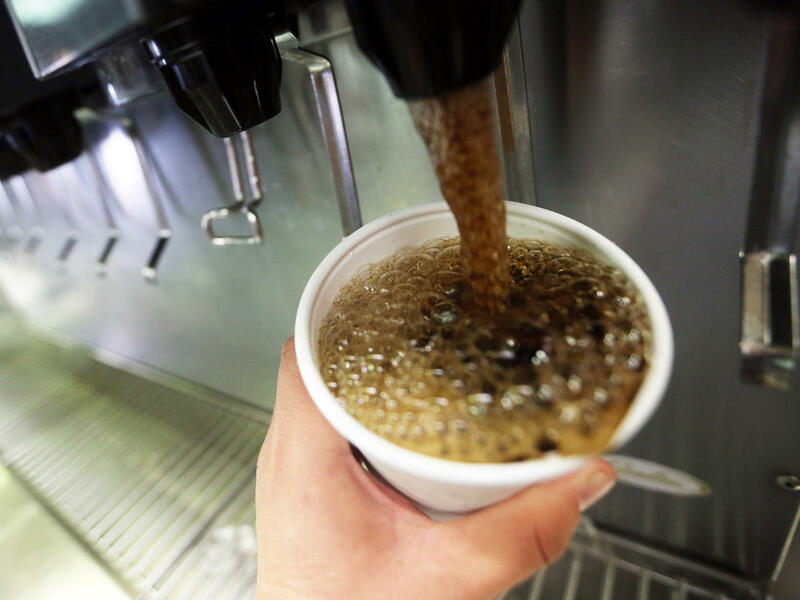 "This is a very low-cost way to get children old enough to make their own purchases to drink fewer sugar-sweetened beverages, and they appear to be effective even after [the signs] are removed," Bleich said. "Black adolescents are one of the groups at highest risk for obesity and one of the largest consumers of sugary beverages. And there is a strong scientific link between consumption of sugary beverages and obesity. Using these easy-to-understand and easy-to-install signs may help promote obesity prevention or weight loss," she concluded.